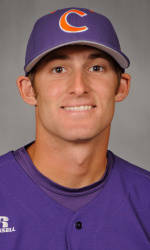 Brad Miller was named a Louisville Slugger First-Team All-American by Collegiate Baseball at shortstop, announced Thursday. The junior from Windermere, FL is the Tigers’ first first-team All-American by Collegiate Baseball since 2002, when shortstop Khalil Greene earned that honor on the way to being named national player-of-the-year. Miller, the 2011 ACC Player-of-the-Year, leads the ACC in batting average (.419) and on-base percentage (.523). He has also totaled 11 doubles, three triples, five homers, 46 RBIs, 51 runs, and 21 stlolen bases in 52 games (50 starts).